Is there anyone who isn’t a fan of Nigella Lawson? Okay, don’t answer that because I don’t really want to know. This season of US election vitriol has left me weary of dissension and backbiting and intolerance. Plus I adore Nigella so I would have to leap to her defense and, frankly, I have been traveling and staying up late nattering with good friends, eating good food and drinking good wine, and I just don’t have the energy for jumping about defensively. Anyway, the point is she has some wonderful recipes and even if you don’t like her seductive manner or are jealous of her ample cleavage, you have to agree about that. One of my very favorites is a clementine cake (originally from her How to Eat) which calls for boiling the whole fruit and then pureeing it. 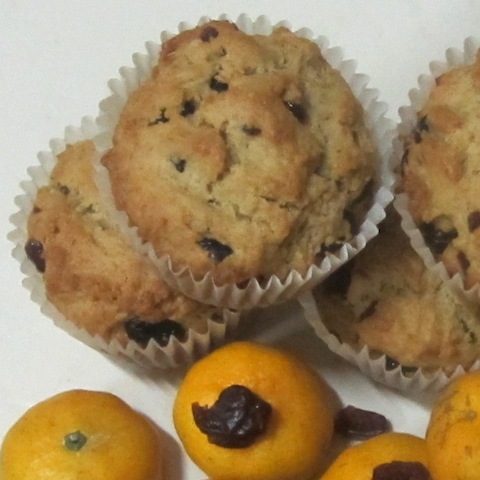 When I got the recipe for this week’s Muffin Monday, I was mulling the options for a dried cranberry muffin and the friend I am staying with this week said, “Why don’t you add orange zest? Orange and cranberry go so well together.” And Nigella’s clementine cake recipe jumped into my mind and I responded, “You are so right, but I think I’ll go one better than zest. I’ll add whole clementines! (We happened to have some handy.) 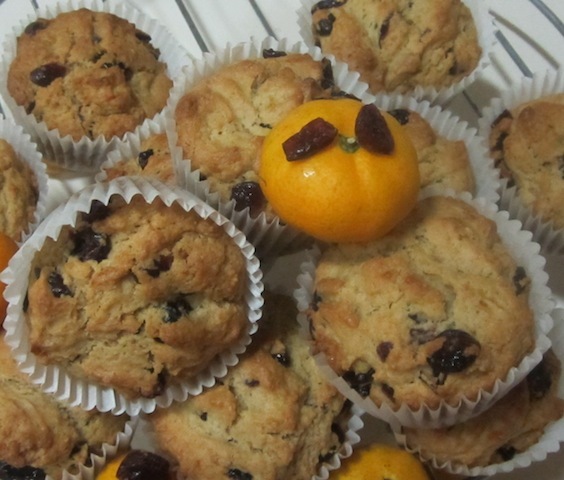 And so I did and, if you are a fan of orange marmalade, you will like these muffins. They are not very sweet so they are definitely a breakfast type muffin rather than dessert. The original recipe is from Taste.com.au. Pop your whole clementines into a small pot and cover with water. Bring to the boil and then simmer, covered, for an hour. Check occasionally and add more water to cover if needed. Preheat oven to 400°F or 200°C. Line your 12-cup muffin pan with paper cases or grease it well. Combine flour, sugar, salt and cinnamon in a large bowl. Whisk milk, oil and egg together in another bowl. When the clementines are done, drain off the water and cut them open to remove the seeds. Puree them in a food processor and allow to cool. Add the cooled clementines to the liquid ingredients and whisk again. Add liquid mixture to the flour mixture and stir until just combined. Divide your batter evenly among the muffin cups. Turn onto a wire rack and allow to cool. These are best served warm. My two favorite fruits together at last! Now all I need are some clementines and I am in business. Thanks for the recipe! Thanks, Lyn, but I really can't take credit. If you haven't tried Nigella's original cake, you should! It's superb. If you can't find clementines, you can use tangerines or oranges, Kelli. Just make sure they have really thin skins. super!! can't wait to try it! how many muffins does the recipe make? Thank you! This will fit in one 12-cup muffin pan.